Regular face-to-face communication is difficult. Attempting it with a baby is near impossible, even if you are the parents…so why not try something new and slightly unconventional: baby sign language! My Smart Hands, an international baby sign language program, has released an education app called Baby Sign Language Dictionary to help you learn. The first tab in the toolbar, A to Z, features a listing of all the words in alphabetical order, which you can search through by tapping the magnifying glass in the top right corner or by sliding through the letters on the right side. Tapping on a word will bring you to an instructional video by Laura Berg, founder and director of My Smart Hands. First, she will demonstrate how to sign it, and then talk you through the motions. Usually there’s an explanation or a handy tip (or both) to help you remember how to sign the word. From there, you can add a word to your Favorites, for later viewing and reviewing. There are over 300 words and 45 minutes of video in all. The second tab, Categories, separates many of the words into sections such as Animals, Colors, Questions, etc., so you’ll be able to learn related words as a group. You can add any word into your Favorites list through their video page, and then organize it as you see fit. Lastly, the Quiz tab tests your burgeoning knowledge; tap Settings in the top right corner to contour the quizzes to your level. It’s multiple choice, so don’t sweat it–it’s a fun and helpful way for you to learn and recall what you’ve learned. The absolute best thing about this app are the instructional videos, because they definitely take steps to help you learn by explanations and memorization tips–and they actually work. Furthermore, all the videos are housed in-app, so there is no internet connection required to play them. This makes the app a bit on the bulky side, but it’s completely worth the space. This app is committed to its mission, and it absolutely shows. What might make it even better is the inclusion of exactly how to go about teaching a baby sign language, or at least some hints (My Smart Hands offers classes for this, which you can explore at their website www.mysmarthands.com). An added bonus would be future updates, with more words and videos. If you’re balking at the $4.99 price tag, there is a free Lite version with 33 words to get you started–give it a go, it can only help. 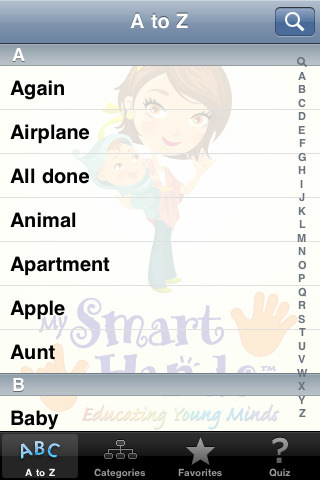 AppSafari review of Baby Sign Language Dictionary was written by Julie Guan on May 11th, 2010 and categorized under App Store, Education, Featured, Fun, Mini Games. Page viewed 5687 times, 4 so far today. Need help on using these apps? Please read the Help Page.